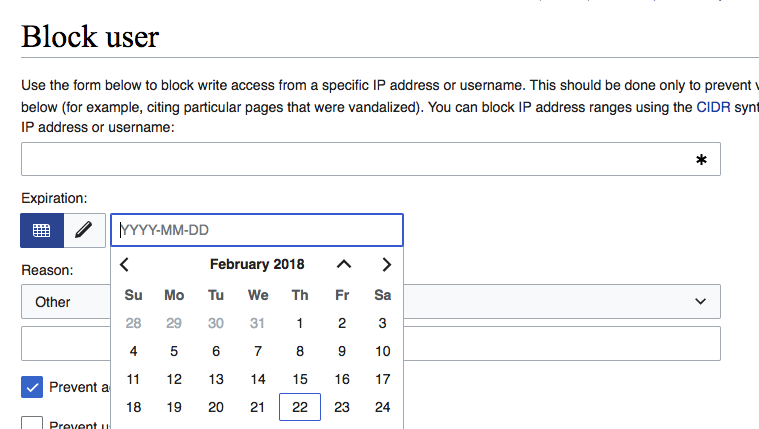 When blocking a user via Special:Block it would be helpful to have a calendar as datetime selector to select a specific day and hour in the future as expiry time. This avoids typing a (english) timestamp in the correct format inside the duration field, when not using the default block duration from the drop down list. On Special:Block, add a buttonSelectWidget in front of the expiration dropdown. This element should be skipped in the tab ordering of the block page. The first button option should be a pencil icon, which should be selected by default. When it is selected the expiration dropdown and text field should behave as they do today. The second button option should be a calendar icon. On submit of the block, the system should calculate when block length between the current datetime and the selected datetime. Toggling between the two options (pencil + calendar) should not result in any data loss. Whatever is selected when the user submits the block should be submitted. Note that in these mockups the order of the pencil and calendar icons are incorrect, and the calendar input is just a dateinput, when it will be a datetimeinput. We'll want to add the DateTimeInputWidget which will be hidden behind a buttonSelectWidget, as seen on UploadWizard. 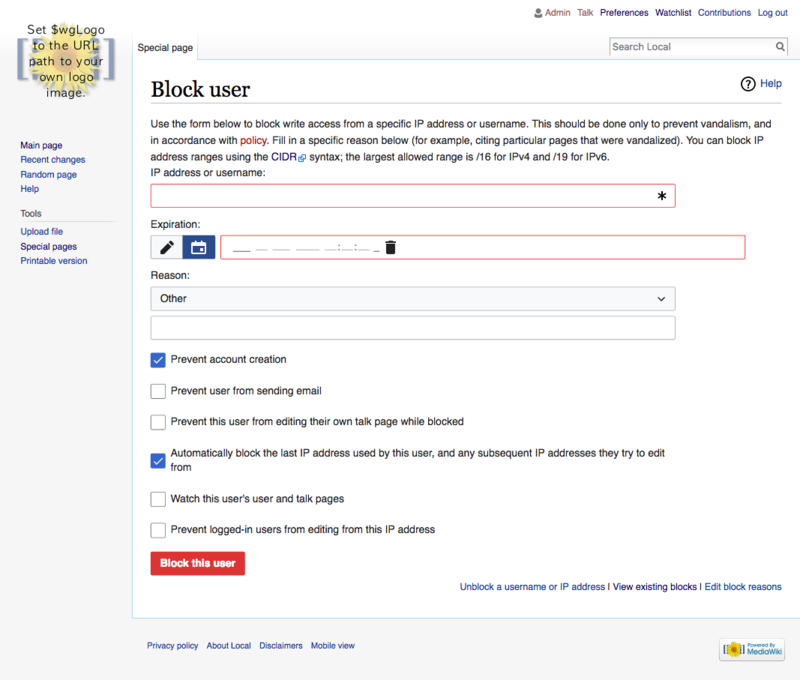 The block would still be saved the same way, the calculation would happen before 'Block this user' is clicked. I created T189382: OOUI JS loads too slowly on Special:Block for this since it seems like a bigger issue. The DateInputWidget does not have the time select, but it has the design in the mock, the DateTimeInputWidget does have the time select, but has a different design. Which would you prefer? 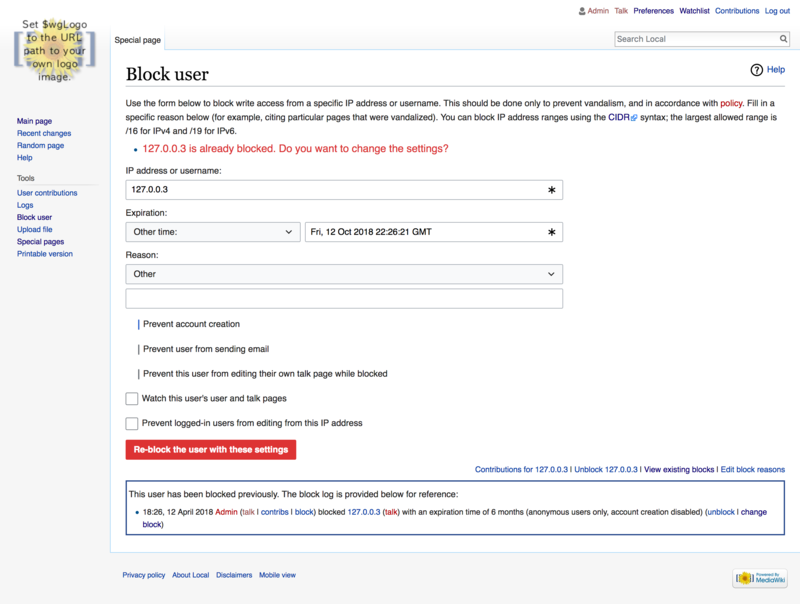 The user should be able to select a date and time for the block to end. My doctored screenshots use the incorrect UI. Please use DateTimeInputWidget. 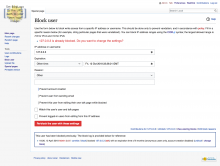 TBolliger changed the status of subtask T188128: Create a functional-looking mockup for Special:Block datetime selector from Resolved to Declined. TBolliger edited projects, added Anti-Harassment (AHT Sprint 17); removed Anti-Harassment (AHT Sprint 16). TBolliger moved this task from Ready to In progress on the Anti-Harassment (AHT Sprint 17) board. This avoids typing a (english) timestamp in the correct format inside the duration field, when not using the default block duration from the drop down list. If I understand this correctly, the problem (the bug) is not a UX issue (that the user has to specify a relative time), but instead an I18n bug (in which, the input must be specified in English). To determine if this is correct... do English speakers want the date picker? Or would they continue to use the drop downs / relative input? The solution then, should be to fix the relative input to be I18n. I do not think the solution should be to create a new feature which would only exist as a workaround to a bug and would have to be supported. On top of that, if we implement this feature, we'd still have to fix the I18n bug in the relative input! I propose that the drop down uses translated strings for the labels that are displayed to the user (I noticed that it doesn't right now), and the value (that is sent to the server) is a ISO 8601 time interval. When the user selects "Other", two inputs will be displayed, one that allows the user to specify a number and another select form field that allows the user to specify the unit (i.e. "days", "weeks", "years", etc.) in their language. This provides a more consistent UI, fixes the I18n bug, reduces the scope of this issue, and does not introduce any new features. 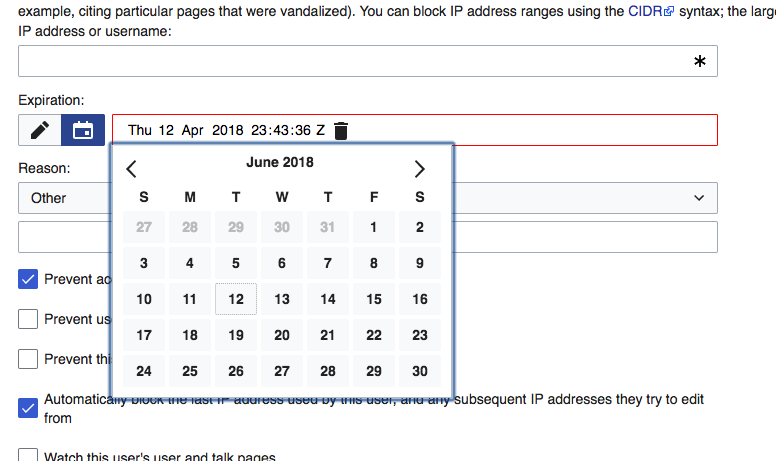 The only downside is that I'm almost done with the date picker, but regardless, I don't think it's worth the cost of implementation, especially when we'd have to open up a new ticket to fix the I18n bug. 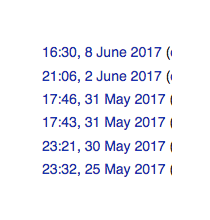 I think offering both the datetime expiration picker and a length dropdown is valuable to all wikis regardless of language. Some blocks are for common infractions — e.g. someone vandalized, they get blocked for ~30 hours. But some blocks are more nuanced — e.g. 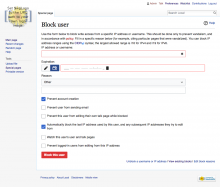 two users are in conflict, block them until we can synchronously discuss it on wiki. I'm very curious why this didn't come up during our blocking consultation. Did we not get enough non-English participants? Granted, the page on Meta was in English but we reached out to 10 Wikipedias of 10 different languages and did see some language-specific feedback. Just not about this. I'd really like to hear from @kaldari about this, but my current instinct is to implement the datetime picker on top of the existing (arguably flawed) system and open a new task to talk about proper i18n support. I've given this some thought, and I think @dbarratt's idea makes a lot of sense. 99% of blocks use the pre-set values, so I don't think we need to build a complicated UI for handling the other 1%. As David mentions, the datetime picker idea is basically a workaround that doesn't completely solve the problem. I think what's really needed is an easy way to enter non-pre-set values without having to resort to English. The easiest way to do that is probably the system David describes. While we're in there, I would recommend moving "Other time:" to the bottom of the list (since it's the least used and most difficult of the options), i.e. moving Ipbother after Ipboptions. But that's just a thought. BTW, you can get the translated time unit names from the cldr extension I believe. Take a look at the TimeUnits.body.php file. In general, because the AHT team is working on the Blocking tools, I think most people are more focused on items that are more relevant to mitigating harassment. We didn't do a general call for people to tell us everything that they have problems with related to the blocking tools. If I remember correctly, the idea for a datetime picker came from de:wp. If so, let's check in with the people who wanted the feature to understand which solution(s) are needed to fix the issues that they were having with the current way to set the time. Sydney remembers correctly, I brought that in from a discussion on de:wp that unfortunately sprang up just a few days after the closing of the blocking consultations. 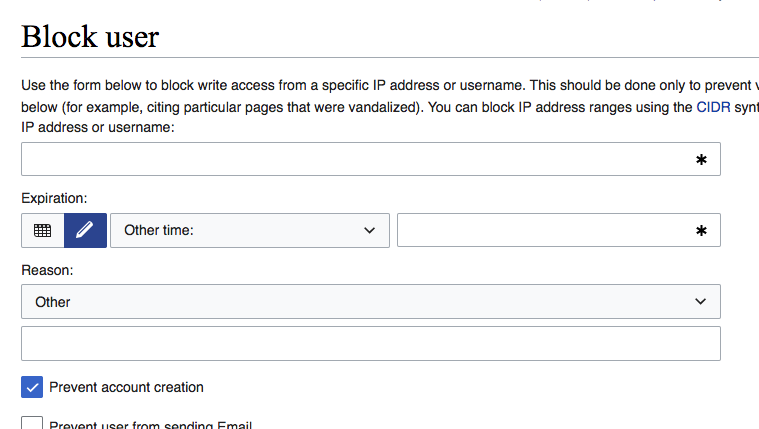 The length dropdown menu with a flexible option would help solve a lot of the problems, but would still require some outside calculations for one common use-case on de:wp - reinstating a block that was lifted to allow the user to take part in public discussions on his/her request for unblocking. Here the datetime expiration picker would be perfect. But the length drowdown might have a wider range of applications across all wikis. We talked about this at length in today's AHT standup. We agreed to complete this task (T132220) as currently described. Fixing the i18n issues that David discovered and helpfully described in T132220#4066969 is another important problem to address, but will likely require a lot of discussion on wiki as it could be interruptive of existing workflows on the current interface. David will create a new task. So, we can enable this on a wiki-by-wiki basis? Ah ok gotcha gotcha. I think it's fine to just release to all wikis, but should probably hear from @SPoore about a release strategy. I can't QA "Temporary Config flag" but everything else hits the Acceptance Criteria! For the first release, let's only enable on meta, mediawiki.org, and de.wikipedia. TBolliger edited projects, added Anti-Harassment (AHT Sprint 18); removed Anti-Harassment (AHT Sprint 17). TBolliger moved this task from Ready to Review on the Anti-Harassment (AHT Sprint 18) board. @Samwilson — Curious if this happens for this widget on all uses in Timeless, or just on Special:Block. I guess I could just attempt to parse with Date() and if successful, pass that object to moment? That would bypass the deprecation warning, but it would also not give moment an opportunity to parse it itself. I figure, if the feature is removed in the future, it (shouldn't?) matter because every time I see the deprecation, the Date() parsing failed anyways, so the removal of the feature, shouldn't result in any problems. A bigger issue is the console.log() that happens, and older versions of IE do not have the console object, so the notice will throw a fatal error, but I assume moment is first checking for console.log before attempting to use it. It's probably fine to leave the deprecation warning in, but maybe there's a way around. Am I reading things correctly: the date only needs to be passed to Moment when the relativeField is "Other time", and not for the other ones? But it's hard to check for that in that spot because the relativeField's change event is getting its value from itself *or* the other text input, so the only way to check is to see if it parses as a date? Maybe it'd be possible to decouple those a bit, and see if it's 'other' or not, and then parse the date. Uhh... so... basically any wiki can specify their own options, and technically anything that strtotime() supports will work. I'd like to change this to use a standard (non-english) format in T190449. But yeah, even with that, it would be transferring a relative date to a precise one (and that obviously wont work well in reverse), so we could just limit it to only working when the "other" is selected, but if a wiki removes all of the options, then it's only a text field. There's also nothing that stops someone from specifying a relative date in the other field, so I can write "2 days" and that will work (since strtotime() can parse that without a problem). So I think we should try to parse it the best we can (with moment? with Date()?) since there isn't an equivalent to strtotime(), and if it fails, no big deal. I mean the alternative is is that we don't even try, but I think trying makes a better UX. TBolliger edited projects, added Anti-Harassment (AHT Sprint 19); removed Anti-Harassment (AHT Sprint 18). TBolliger moved this task from Ready to Review on the Anti-Harassment (AHT Sprint 19) board. This is a defect of the DateTimeInputWidget. It was actually wider by default and I made it shorter. I like it lining up with the other fields... maybe the trash can should be right aligned? Would that fix the problem? So you can't make the field smaller? Maybe set a max width? or create two columns in that row? If there is nothing you can't do the fine. Are you saying it should be even shorter? What are your thoughts @TBolliger? Don't forget the calendar pop-up is an even different size! I think leaving it as it is on http://commtech.wmflabs.org/wiki/Special:Block is fine. I'm talking about the format you get when you switch to the textfield (pencil) after you pick a date on the time picker. Right, so the problem is, is that you need to be able to switch back and forth between the two and it needs to be able to parse the format. I don't care what format we use, but it needs to be consistent. @TBolliger, so @dmaza is saying that we should not change the format because that's not part of this ticket (and could anger some people, especially on English), but on the flip side, maybe it's a good opportunity to use a language neutral format? What do you think? I don't anticipate too many people will actually toggle back-and-forth repeatedly. Sure, it's possible and yes, we should provide the best experience but I don't think this is the most crucial detail to split hairs over. But as we know, T190449: Expiration field on Special:Block only accepts English input which makes displaying the month name (rather than number) for non-EN communities less than ideal. But if this is the existing behavior than I will agree with Dayllan and not change the existing behavior. We can fix the i18n issues in T190449. dbarratt added a parent task: T192620: Remove $wgExpiryWidgetNoDatePicker temporary option. @TBolliger & @SPoore This will go out on the train and be enabled on all wikis. In T132220#4086762 (yeah, it was a month ago — sorry!) 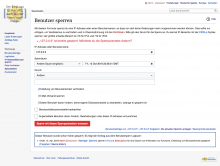 we agreed to enable on meta, mediawiki.org, and de.wikipedia for the first release. 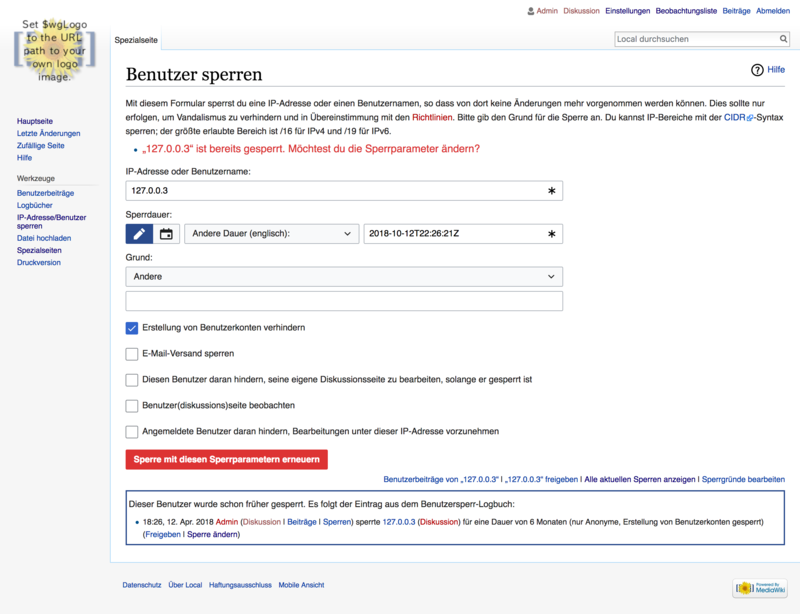 dbarratt added a parent task: T192962: Disable Datetime Selector on Special:Block on all wikis except Meta, MediaWiki, and German Wikipedia. Whoops... missed that, let's update the config before this is released then. :) I created T192962 to do that. TBolliger moved this task from To Triage to Announce in next Tech/News on the User-notice board. quote: "hi, when I select a calendar on Special:Block and then choose a day other than this day, for example tomorrow, after that I can't select again this day, it's not selectable anymore. I can select this day again if I change the seconds or minutes to future. But I think it's better to make always this day selectable and if the time is in past just give a warning. Stryn (talk) 13:42, 4 May 2018 (UTC)"
Thank you, @TheDJ . These seem to be requests for improvements to the OOUI elements, which is outside the scope of this ticket and the Anti-Harassment team's purview. I'll make sure their feedback is documented on Phabricator tasks and I will respond on meta wiki by end of day today. @dbarratt, as far as I know it still does not work, despite "MW-1.32-release-notes (WMF-deploy-2018-05-01 (1.32.0-wmf.2))". This isn't deployed on every wiki (disabled via config) where are you attempting to use it? 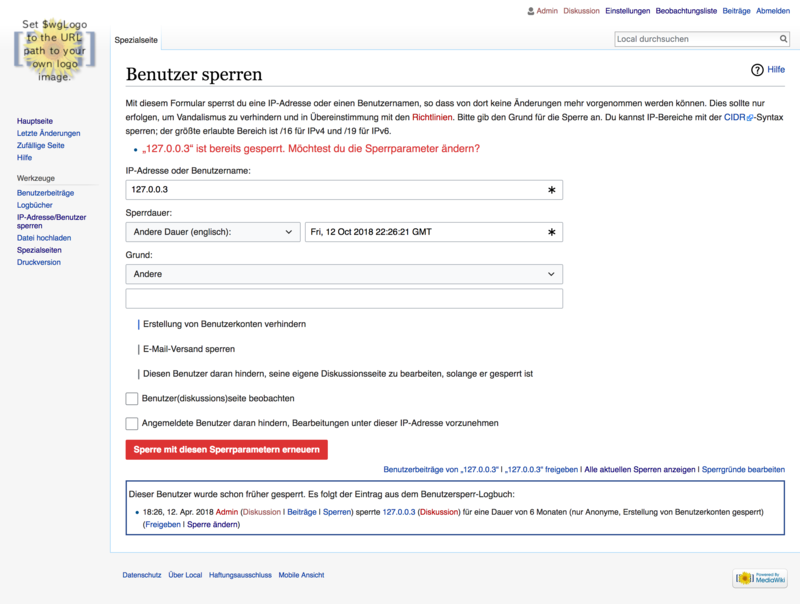 On hewiki. Why isn't? It's dangerous? It should be going out next week. Blocks are a critical piece of functionality and we're extra-careful with anything related to them.